The Dallas Police Department knows how to get cop-car nerds clicking all over their Facebook page. 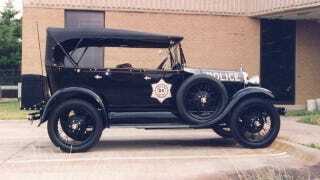 They've compiled pics of 85 years of the city's police cruisers, starting with the 1928 Model A shown above, which undoubtedly chased down some oil playboys in its day. While Ford made a strong showing for the first four decades, Chrysler stormed in during the mid-1970s, and hung in — notwithstanding some dalliances with GM products, and an ill-fated, The Rookies-era use of the AMC Matador — until the Ford Crown Vic retook the cruiser position in the late 1990s. These days, though, it's apparently all about the Dodge Charger. Note also the CHiPs-grade Kawasaki patrol bike.